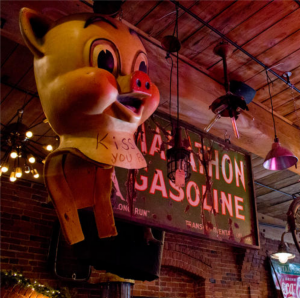 Living in Nashville for the past several years, Mike has developed a special appreciation for the historic sections of the city. He’s determined to call attention to the architecture and style of its early 20th century residential areas and to do what he can to preserve them. 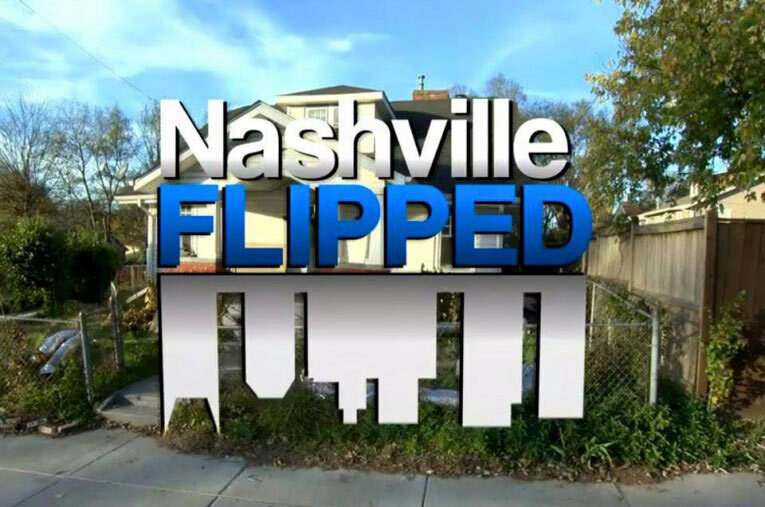 NASHVILLE FLIPPED isn’t just another house-flipping show. Mike met house-flipper Troy Dean Shafer a few years back and they shared a passion for the historic places in Nashville. Mike worked to create a format to turn this passion, and what Troy does, into a show to share it with a larger audience. They conceived the series as an opportunity to find and rehabilitate century-old family homes, revitalizing them while taking care to preserve their historic architectural elements and using the episodes to teach viewers a little about how life was lived in the first 35 years of the last century. Nashville house-flipper Troy Dean Shafer takes the reins on-camera, meeting the challenges of accomplishing a flip that’s both a financial success and an example of community preservation. With his friends at Tacklebox Films, Mike is executive producer and creator of this new series. 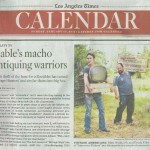 It is set to premiere on DIY Network on Wednesday April 13th at 10pm ET/PT. Can’t wait to see your new show!! love seeing old houses being taken care of. I was born in Louisville Ky. so many old homes!!! I just loved walking thru them and seeing the past!!!! I now live in Custer City Ok. maybe around 400 people still here,my house is over100 years old I loved it the first day I walked in!! was built by a Dr. Parker the only doctor around here and he worked out of this house! It was one of the first houses built in the town itself. so I can’t wait to see all the older home get a helping hand!!!!!! we’ll be watching!!!! So interesting Cathy. I lived in Louisville when I was a child and my parents are from Custer County, Oklahoma, both grew up there. We all live in Mississippi now. 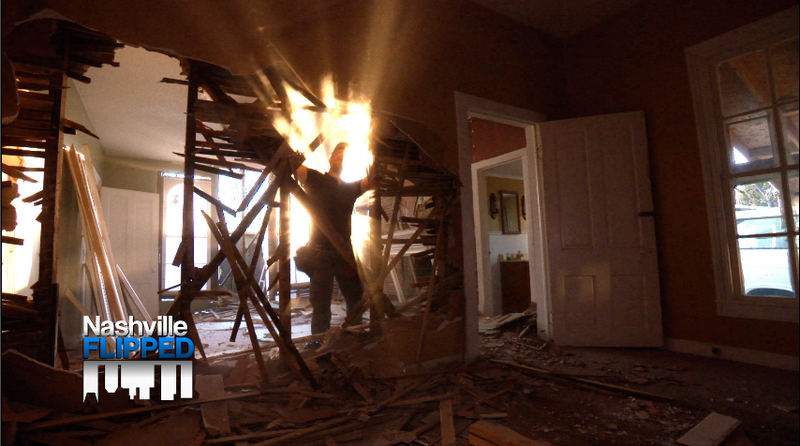 I am looking forward to Mike’s new show restoring and preserving these older homes. We love the show now and know this one will be great too. Thanks so much, Happy New Year! I lived in Louisville for 3 years. What a beautiful city. The homes are spectacular. Bardstown Rd is fun. I saw a lot of live music there. Also, they have an awesome public radio station – WPFK. I’ve lived in several smaller cities: Buffalo, NY, Milwaukee, WI, Columbia, SC and Atlanta. Buffalo is America’s best kept secret. The architecture there is beautiful. Once upon a time, Buffalo was the Queen City. The other cities have their own charm and history. I’m from and now live in Boston, MA. Everything is historic. I hope they don’t ruin the charm with too many skyscrapers like Manhattan. One of a kind show. I love going virtually into the old barns and sheds…with the boys. I love nostalgia .You both fit the part….and I’m glad your’ both a hit. Best Blessings to the group. I just wanted let all of you know that My wife & Me love watching your show. We watch all the time. Was looking up your Nashville,Tn. store & plan on visiting it soon. We live in Alabama. I don’t miss an episode…I love Mike and Frank! I love my junk too. Visited the store in Nashville and it is wonderful, I had a great time. I’m very excited about your new venture on HGTV…they need help desperately! So disappointed about the old Hershey Factory…noticed the sliding “barn” door…hope you collected that! Thanks for your website and information…I love it!!!!!!!!!!!!!!!!!!!! we were also the proud onlookers of the Durea Brothers Who Built the first Car in Springfield Ma. Looking forward to your new show!! I have been to your shop in Iowa several times and purchased items there. I hope that you will incorporate some of your finds in your new show! What a great way for people to see items you have picked in new, fresh settings. The industrial farm house style is really hot right now, so I can’t wait to see what you bring to the HGtV family of shows. Keep up the good work, Mike. As a kid up thru my adult years we lived on a farm or had relatives who did and my cousins and my sister and I would go exploring behind the farms in the woods and all over to find abandon homes. Found a rock house the roof was gone but we had so many fun times and found o many odd things in the remains. A few arrow heads and old furniture . It’s a treasure hunt ! We were in your Nashville store today and bought our son Evan the Rust Drugstore baseball uniform to put in his room because he loves baseball! We were wondering if you could give us any background information on it, like where you found it or where the baseball team played etc. We absolutely love your show and have been watching it with both of our kids that are 12 and 9, for years. They enjoy picking as well 🙂 We enjoyed visiting your store and hope to go back one day! I restore cars and houses. Love the shows and have not missed one. it excites me every time I get to watch a new episode. I went all over the US with my grandparents when I was a child. We went to as many steam engine shows as possible. I helped clean, paint, and setup many engines at some of the largest steam shows in the US. I now don’t get to any shows now but still love to see your shows with steam and gas engines in them. I love everything Old, hope we can preserve as much as possible. Things are not made like they used to. Thanks for the great show. They really don’t, do they? Thanks for tuning in, Stephen! 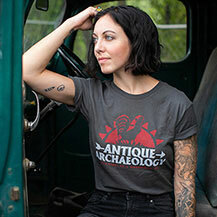 Wondering what inspired the logo (rooster sign) that represents Antique Archaeology? Great question, Hank! The short version is it’s inspired by one of Mike’s earlier picks. I am a huge fan of your show, but I was very disappointed when I visited your store in Le Claire. I drove three days(seven to eight hours daily) to get to LeClaire. I wanted to buy something valuable, but all I found was a store filled with mugs, t-shirts, key chains, caps, and other junk. 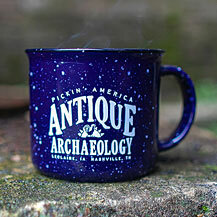 I was disappointed with what wqs offered at Antique Archeology, but I did enjoy what the rest of the town offererd. I hope my trip to your Nashville store will be more productive! Hi Barbara. We cannot wait to see you in Nashville! We know that often people expect us to have warehouses of picks, but it’s just not so. We sell items just as quick as we unload them from the van. (Not a bad problem to have!) Hopefully, you were able to check out some familiar pieces and some of Mike’s personal collection on display too. Thank you for being such a big fan! 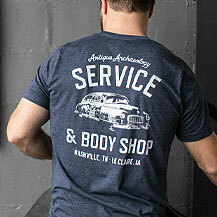 Looking forward to showing you the Nashville shop. Was wondering when the guys are going to return to the Wheels through Time Museum in Maggie Valley, NC. I watch the show whenever it is on, even the nights when they just show the repeats. Looking forward to seeing both Mike and Frank in person. Enjoy seeing all the “finds”. I live in Maggie Valley and moved here from NJ last August. Just wanted to say I am a huge fan. We don’t get the new shows as we don’t have cable or satellite tv but look forward to the new episodes when they air. Will be coming to your Nashville store in July. Very excited! Awesome, Michelle! See y’all in July! I am a Big Fan from Mississippi. I could just Kiss your Brain, so much information. Thank You, for all of the free education done in a fun way. First, let me say I have to be one of your favorite fans. 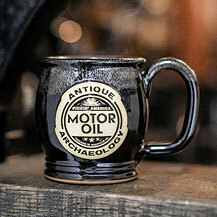 I watch the news in the mornings…, then pretty much nothing else except American Pickers. I live in northern Pickens County, SC…, so especially enjoy your trips to my neighbors! If it’s not a day when you are on for hours on the History Channel, I think I have practically all your episodes recorded on my DVD. I have watched them all several times, and never get tired of them. I, like you, have a passion for anything made in our great history…, but also have a special passion of things from the 60’s, my early childhood. I enjoy auctions, yard sales, and a little picking on my own…, but know that often I step over some things that have value, and significant history. But gotta say, you and Frank, have really helped me to notice some of those things. My 35 year old son has also developed a real interest as well. Anyway, my favorite TV night is Wednesdays at 9:00…, always hoping for a new episode. Thank you for reminding America of its great heritage and ingenuity! P.S. Tell Danielle she is the hottest chic on TV!! My husband and i have been watching Pickers since it first started and was watching Flipping Nashville and noticed your name with the credits. OH MY ! Love these flipping shows and the fact that they are taking the old houses and redoing them to making them beautiful again!!! My question to anyone out there is does anyone know a person in the Charleston area who does this? We are moving that way from Atlanta with retirement and want an older non cookie cutter /subdivision home that has character and charm. Please please let me know of anyone who loves history and do this in a timely manner. Thanks very much for any help with this. 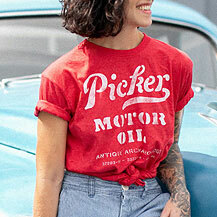 Have been a fan of American Pickers for years. But my post is about Nashville Flipped. When I saw the first 4 episodes of the show, I contacted Troy to compliment him on his vision & dedication to being authentic. Then there were no more shows! I contacted HGTV to let them know I wanted more. Well I believe someone listened, as I just recorded some new shows. Mike, I didn’t know this was your creation until now so thank you. 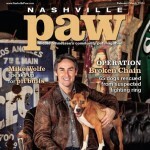 I am also missing new episodes of Black Dog Salvage & West End Salvage. Competitors? Or can you help get more of these shows on too. 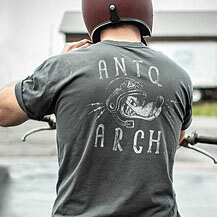 We love Black Dog as well! Sure miss their shows! If you get Netflix, check out Backroad Bounty! It’s similar to AA, but in Canada. Everyplace is a dirt road! And they sell their finds on line! As the guys say, Sweet Pickin’! Blessings! Love Nashville Flip, the plummer is the husband of one my friends from school. She also has been on the show. Not bad for a girl from a two lane town in southern lower Michigan. Dear Mike, I had no idea that you’ve lived in Nashville so many yrs. What about Frank? I just assumed U both loved in Iowa…lol. I hope U read your e-mails, from caring people. What U 2 are doing is fantastic! We so need everyone to try to remember our history & preserve our past. 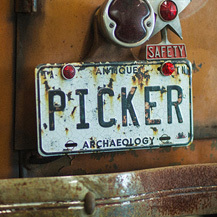 I hope parents let their kids watch Pickers so that they can realize how important it is too, so they can carry on (picking) as it isn’t hard to do, but is fun & interesting. I am disappointed that I don’t get the DIY network on my cable as I would love seeing your show. Carry on you two & HAPPY HUNTING! Your fan always…..
Hi Nedra! Mike has lived in Nashville for almost six years (for as long as the Nashville shop has been open) and Frank hangs out in the Midwest. We get plenty of families visiting both shops with the children being the original fans and bringing the parent into it! 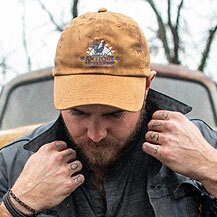 It makes us so happy to see how diverse Picker Nation and that y’all can appreciate what we are trying to preserve. Come visit soon! We’d love to meet you! Just a note to let you know that I love your show. Just saw on this website about your new show – I can hardly wait. I appreciate what you do and all the things you get. Thanks for sharing your knowledge. I just wanted to say both me and my wife likes watching your shows.We are planning to come to Nashville in May to visit our grandkids and would like to stop by your store we drove by it going to a football game last year.We live in WV,hope you come back to pick here again.Keep up the good shows. William- when is your visit? My eight year old granddaughter is a huge fan. She watches with me up here in Maine, she is especially a fan of Mike. I know you are picking Maine soon. I will bring her to Waterville and look around d for your crew. She would love to meet you.anyway if I don’t find you hope you have an amazing time filming and picking In maine. It’s a great State. Lots of good junk. Thanks for the great sho we really appreciate and enjoy all the episodes. I’m really enjoying Nashville Flipped. Troy and Julie do such wonderful work! It’s a real joy seeing these old places being brought back to life. That’s wonderful for Nashville. Unfortunately, that’s not the case where we live. We’re seeing whole city blocks of gorgeous old homes being demolished to make room for student housing in this college town. Like we don’t have enough already? And the big mega churches are taking over downtown & buying up more & more old houses & buildings which they quickly rip down so they keep on expanding. it’s like they’re in a competition to see who can be the biggest & the best. Our town is steadily losing all it’s historic charm due to a total lack of regard for these lovely old places. It’s so depressing to see. I’m just glad that there are other towns that DO respect their history! Keep up the good work! 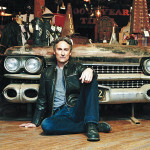 I spoke with your producer and told her about the guitar museum my friend Gordon Close has in a suburb of Denver, plus he has some old cars, and if you guys come back to Co. since I live in the Springs I’ve talked to a few more people that have things you may be interested in, motorcycles, etc. I was in a couple of accidents and although I’m improving I’m finding the need to sell some of a guitar collection I’m in charge of one should go to the Wolfe family because my Indian name is Singing Wolf given to me by the Southern Co. Ute Tribe. My guitar has an inlaid mother of pearl wolf howling at the moon that takes up almost the entire body. It’s got custom pickups and is a telecaster. I so hate to give it up but if I have to you are the first person I thought of. I also have the last series of a WAshburn acoustic made in the US in 82, an ibanez Jazz that spent most of its life in a studio so is almost perfect, a 64 Epiphone acoustic, and a 64 Banjo completely original and plays great made by Kay and called a Silvertone sold by Sears back in the day. Let me know if you are interested in any especially my Wolfie.